Multiple sclerosis (MS) is a chronic disease characterized by the destruction of central nervous system (CNS) myelin and often the underlying axons.1 Its pathology has hallmarks of an autoimmune disorder including an inflammatory response accompanied by leukocyte infiltration into the nervous system. This requires an array of physiological changes in the blood vessel endothelia, resident central nervous system cells, and cells of the immune system. For instance, activated blood vessel endothelial cells and immune cells upregulate adhesion molecules that provide the traction necessary for extravasation (or diapedesis). Members of the chemokine family are expressed by numerous cell types and may regulate adhesiveness or act as molecular chemoattractants in MS lesions. In addition, proteases target components of the blood-brain barrier (BBB), providing pathways for leukocyte migration into the CNS parenchyma. Many studies have examined how changes in the levels or activities of molecules implicated in leukocyte trafficking are involved in MS. This mini review will focus on several of the primary mechanisms thought to be involved in leukocyte transmigration by highlighting evidence obtained from MS studies, supplemented with information gleaned from the animal model, experimental autoimmune encephalomyelitis (EAE). MS progression and severity may vary significantly between individuals. The most prevalent form, relapsing and remitting MS (RRMS), is characterized by exacerbations followed by periods of inactivity. RRMS may develop into secondary progressive MS (SPMS), characterized by a lack of remissions. MS may also take on a primary progressive form (PPMS), characterized by a continued progression of the disease from its onset. Approximately 70% of RRMS patients are female.2, 3, 4 The age of onset of RRMS is highly variable (10 to 60 years), but peaks at approximately 28 years, making it the most common CNS disorder of young people.5 Myelin plays a critical role in insulation of nerve fibers and regulates the speed of neurotransmission. Accompanying myelin destruction and associated axonal degradation are among any number of neurological symptoms that vary widely between individuals. These range from minor tingling sensations and numbness to cognitive dysfunction, breathing difficulties, and blindness. However, many studies also suggest that this Th1/CD4-centric view might be an oversimplification. For instance, CD8+ cells appear to be the predominant T cell type found in MS lesions, and their cytolytic activities have been implicated in more aggressive forms of the disease.34, 35, 36, 37 In addition, MHC I and not MHC II appears to be expressed on oligodendrocytes and neurons, and MHC I is upregulated on these cell types in more severe cases of MS.38 Some reports also indicate that blocking Th1 cytokines might enhance the severity of the disease and that MS-associated neurodegeneration may even precede inflammatory responses.39, 40, 41 B cells and plasma cells are found in MS lesions, as well as associated co-deposition of immunoglobulin (Ig) and complement molecules.42, 43, 44 Autoantibodies, including those directed against myelin-associated proteins, can be found in MS lesions and cerebrospinal fluid (CSF).42, 45, 46 Regardless of the complexities associated with MS pathogenesis, the infiltration of immune cells and their activities likely contribute to the loss of myelin and axonal degradation that accompanies progression of the disease. Therefore, it is critical to understand the mechanisms involved in the transmigration of leukocytes into regions of the CNS where they are normally excluded. View Larger Image Figure 1. The selective permeability of the BBB protects the CNS from circulating molecules and cell types that could negatively impact neuronal activity. Vascular endothelial cells are joined by tight junctions. 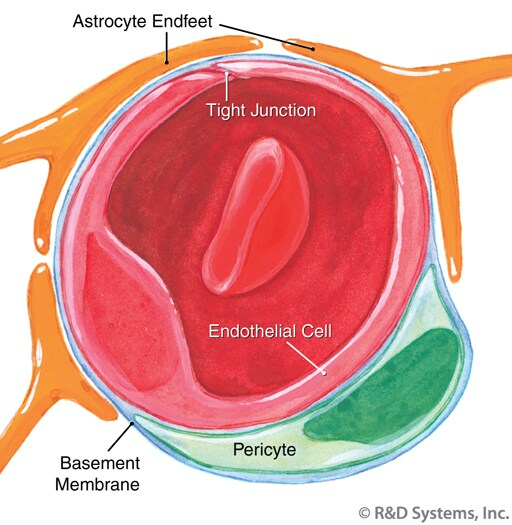 Perivascular cells and basement membrane surround the blood vessel. Astrocytic processes, termed endfeet, help to maintain BBB integrity. The BBB is a critical line of CNS defense, limiting the access of circulating solutes, macromolecules, and cells that could negatively impact neuronal activity. The BBB is permeable to water, oxygen, and non-ionic molecules including alcohol and certain drugs, while other molecules like glucose and amino acids require transport into the CNS.47 Several anatomical features contribute to the selective permeability of the BBB (Figure 1). 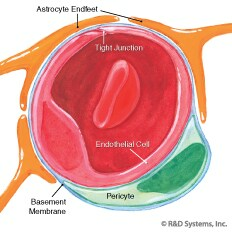 CNS blood vessel endothelial cells are joined by intercellular tight junctions that restrict the flow of solutes. They are also ensheathed by a basement membrane consisting primarily of collagens, glycoproteins, proteoglycans, and laminin. Pericytes found within the basement membrane surround the vessels, regulating morphogenesis and possibly BBB permeability.48, 49, 50 Astrocytic structures, termed endfeet, directly interact with the CNS microvasculature, an activity important for maintaining the integrity of the BBB.51, 52, 53, 54 Although leukocytes are not normally found in the CNS, pathological conditions including bacterial and viral infections can result in trafficking into the nervous system. In addition, inflammatory disorders of the nervous system, including MS, may result in significant accumulation of leukocytes. Consequently, many studies have delved into the mechanisms underlying the disruption of the BBB and the infiltration of immune system cells into the CNS. One of the first steps in diapedesis involves changes in the expression and activities of adhesion molecules on both the blood vessels and cells of the immune system. Several classes of adhesion molecules play significant roles in mediating leukocyte adhesion and are likely to play important roles in MS leukocyte trafficking. Adhesion molecules that may have prominent roles include those associated with endothelial tight junctions, members of the Selectin family, Cell Adhesion Molecules (CAMs) of the Ig superfamily, and the Integrin family (Figure 2). View Larger Image Figure 2. Transendothelial migration requires upregulation of several adhesion molecules. Adhesion molecules join to form the tight junctions between CNS endothelial cells. 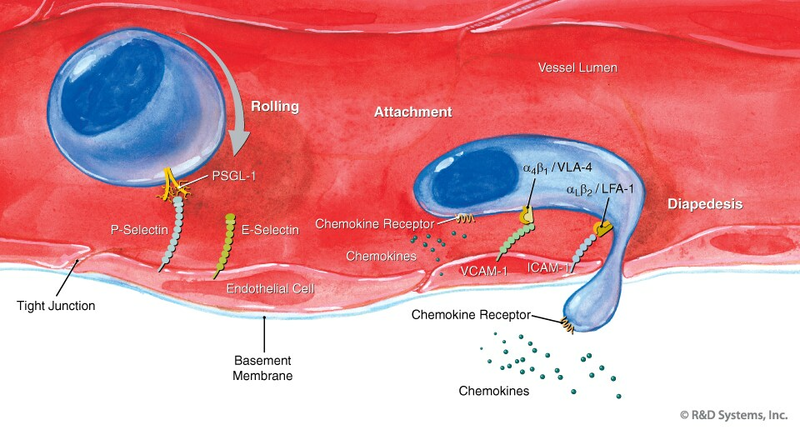 Selectins mediate the initial weak interactions between leukocytes and blood vessels (rolling). Chemokines upregulate the adhesiveness of Integrins, enhancing their interaction with CAMs, and providing the attachment necessary for diapedesis. CAMs of the Ig superfamily play key roles in leukocyte transmigration in several contexts, including inflammatory responses associated with MS. They are transmembrane proteins characterized by repeating Ig-like domains, varied numbers of Fibronectin type III repeats, a transmembrane domain, and an intracellular domain that interacts with the cytoskeleton. These molecules have the potential to mediate homophilic or heterophilic cell/cell interactions or associate with the constituents of the extracellular matrix (ECM). They are expressed by a wide variety of cell types and are involved in diverse biological activities ranging from regulating tissue morphogenesis and axon guidance to tumor progression and metastasis. They also play critical roles in the immune response and are upregulated on leukocytes and endothelial cells in response to inflammatory stimuli and contribute to the adhesiveness of transmigrating cells.87 Among the CAMs thought to play important roles in the trafficking of leukocytes through the BBB are Intercellular Adhesion Molecule 1 (ICAM-1), Vascular Cell Adhesion Molecule 1 (VCAM-1), and Platelet Endothelial Cell Adhesion Molecule 1 (PECAM-1). In humans, significant reductions in alpha4beta1 expression are associated with the subset of MS patients responding to IFN-beta therapy.125, 126 Elevated expression of alpha4beta1 on both CD4+ and CD8+ T cells from MS patients is associated with an increased MRI T2 lesion load.127 The alpha4beta1 integrin has also been implicated as a target for MS therapy. This results from an observed 66% decrease in relapses in patients treated with monoclonal antibodies (natalizumab) designed to directly target alpha4 integrins.105 Unfortunately, soon after FDA approval the drug was removed from the market after 3 of 3000 patients developed multifocal leukoencephalopathy (MLE).128 MLE is a CNS infection caused by the reactivation of a latent JC polyomavirus infection, a common virus that typically remains dormant in immunocompetent individuals. Despite the large setback, the clinical trial results underscore the possible association between alpha4 integrins and MS pathology. Chemokines play significant roles in inducing the change from low affinity, Selectin-mediated interactions to high affinity associations between integrin-expressing leukocytes and the blood vessel endothelia. They may also regulate the trafficking of leukocytes in the brain parenchyma through their activities as chemoattractants. The majority of the evidence to suggest that chemokines might regulate leukocyte migration in MS lies in the demonstration that they are present in the correct place and time to regulate these activities. Several cells of the immune system including lymphocytes and macrophages, as well as resident CNS cells such as astrocytes, microglia, and blood vessel endothelial cells are known to express multiple chemokines and/or their receptors (Table 1).131, 132, 133, 134, 135, 136, 137 Furthermore, the importance of chemokines is enhanced by studies examining the effects that their manipulation has on EAE progression. Table 1. Chemokine and chemokine receptor expression in MS.
Table 2. MMP Expression in MS. Despite the more than 9000 MS/EAE studies published in the last five years, the mechanisms underlying MS etiology and pathology continue to remain unclear. It is complicated by the tremendous heterogeneity that often occurs between individuals and likely contributes to the fact that there is no universally effective treatment for MS. Ideally, greater understanding of the genetics, epidemiology, and cell biology will allow for the future development of treatments designed specifically for each individual. The molecules that regulate CNS infiltration of leukocytes may provide possible therapeutic targets. However, a greater understanding of the processes underlying transmigration is required. Much of the evidence supporting the roles of specific adhesion molecules, chemokines, and proteases in MS is circumstantial, relying on in vitro evidence or the correlation between expression patterns and MS pathology. 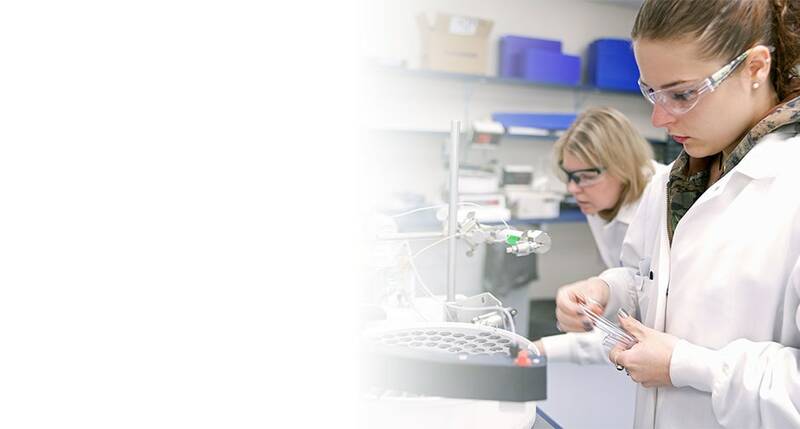 EAE studies also help to provide clues, but there are always questions regarding how applicable EAE findings are to understanding the biology of MS. However, collectively these studies emphasize the importance of several molecules with putative involvement in MS-associated leukocyte transmigration and underscore the need for future studies. Sospedra, M. & R. Martin (2005) Annu. Rev. Immunol. 23:683. Duquette, P. et al. (1992) Can. J. Neurol. Sci. 19:466. McDonnell, G.V. & S.A. Hawkins (1996) Mult. Scler. 2:137. Thompson, A.J. et al. (1997) Brain 120:1085. Coyle, P.K. (2000) Autoimmune Diseases: Multiple Sclerosis, Lippincott Williams & Wilkins, Philadelphia. 595. Willer, C.J. et al. (2003) Proc. Natl. Acad. Sci. USA 100:12877. Haines, J.L. et al. (1998) Hum. Mol. Genet. 7:1229. Hillert, J. & O. Olerup (1993) Neurology 43:2426. Schwarz, S. & H. Leweling (2005) Mult. Scler. 11:24. Fotheringham, J. & S. Jacobson. (2005) Herpes 12:4. Gilden, D.H. (2005) Lancet Neurol. 4:195. Hutter, C.D. & P. Laing (1996) Med. Hypotheses 46:67. Kurtzke, J.F. (2000) J. Neurovirol. 6:S134. Kurtzke, J.F. (1977) J. Neurol. 215:1. Noseworthy, J.H. et al. (2000) N. Engl. J. Med. 343:938.
van den Broek, H.H. et al. (2005) Mult. Scler. 11:349. Matute, C. & F. Perez-Cerda (2005) Trends Neurosci. 28:173. Zang, Y.C. et al. (2004) J. Immunol. 172:5120. Bielekova, B. et al. (2004) J. Immunol. 172:3893. Fritz, R.B. et al. (1983) J. Immunol. 130:1024. Liu, J. et al. (1998) Nat. Med. 4:78. Yamamura, T. et al. (1986) J. Neuroimmunol. 12:143. Colombo, E. et al. (1997) J. Clin. Invest. 99:1238. Schmidt, S. et al. (1997) Brain 120:1437.
van Noort, J.M. et al. (1995) Nature 375:798. Oksenberg, J.R. et al. (1993) Nature 362:68. Merrill, J.E. (1992) J. Immunother. 12:167. Merrill, J.E. & E.N. Benveniste (1996) Trends Neurosci. 19:331. Benveniste, E.N. (1997) J. Mol. Med. 75:165. Raivich, G. & R. Banati (2004) Brain Res. Brain Res. Rev. 46:261. Hendriks, J.J. et al. (2005) Brain Res. Brain Res. Rev. 48:185. Olsson, T. et al. (1992) Eur. J. Immunol. 22:1083. Segal, B.M. et al. (1998) J. Exp. Med. 187:537. Babbe, H. et al. (2000) J. Exp. Med. 192:393. Booss, J. et al. (1983) J. Neurol. Sci. 62:219. Koh, D.R. et al. (1992) Science 256:1210. Neumann, H. et al. (2002) Trends Neurosci. 25:313. Hoftberger, R. et al. (2004) Brain Pathol. 14:43. Lenercept Multiple Sclerosis Study Group (1999) Neurology 53:457. Mohan, N. et al. (2001) Arthritis Rheum. 44:2862. Barnett, M.H. & J.W. Prineas (2004) Ann. Neurol. 55:458. Esiri, M.M. (1977) Lancet 2:478. Lucchinetti, C. et al. (2000) Ann. Neurol. 47:707. Storch, M.K. et al. (1998) Ann. Neurol. 43:465. Genain, C.P. et al. (1999) Nat. Med. 5:170. Mattson, D.H. et al. (1980) Nature 287:335. Ohtsuki, S. (2004) Biol. Pharm. Bull. 27:1489. Balabanov, R. & P. Dore-Duffy (1998) J. Neurosci. Res. 53:637. Betsholtz, C. et al. (2005) EXS 94:115. Dohgu, S. et al. (2005) Brain Res. 1038:208. Haseloff, R.F. et al. (2005) Cell. Mol. Neurobiol. 25:25. Raub, T.J. et al. (1992) Exp. Cell Res. 199:330. Rist, R.J. et al. (1997) Brain Res. 768:10. Rubin, L.L. et al. (1991) J. Cell Biol. 115:1725. Huber, J.D. et al. (2001) Trends Neurosci. 24:719. Wolburg, H. et al. (2005) Acta Neuropathol. 109:181. Carman, C.V. & T.A. Springer (2004) J. Cell Biol. 167:377. Allport, J.R. et al. (2000) J. Cell Biol. 148:203. Bolton, S.J. et al. (1998) Neuroscience 86:1245. Burns, A.R. et al. (2000) J. Cell Sci. 113:45. Plumb, J. et al. (2002) Brain Pathol. 12:154. Minagar, A. et al. (2003) Mult. Scler. 9:235. Mankertz, J. et al. (2000) J. Cell Sci. 113:2085. Oshima, T. et al. (2001) Microvasc. Res. 61:130. Minagar, A. et al. (2003) Endothelium 10:299. Zak, I. et al. (2000) Acta Biochim. Pol. 47:393. Vestweber, D. & J.E. Blanks (1999) Physiol. Rev. 79:181. Ulbrich, H. et al. (2003) Trends Pharmacol. Sci. 24:640. McDonnell, G.V. et al. (1999) J. Neurol. 246:87. Mossner, R. et al. (1996) J. Neuroimmunol. 65:61. Dore-Duffy, P. et al. (1995) Ann. Neurol. 37:55. McDonnell, G.V. et al. (1998) J. Neuroimmunol. 85:186. Giovannoni, G. et al. (1996) J. Neurol. Neurosurg. Psychiatry 60:20. Tsukada, N. et al. (1995) Neurology 45:1914. Kuenz, B. et al. (2005) J. Neuroimmunol. [Epub ahead of print]. Elovaara, I. et al. (2000) Arch. Neurol. 57:546. Droogan, A.G. et al. (1998) Neurology 50:224. Battistini, L. et al. (2003) Blood 101:4775. Wong, D. et al. (1999) J. Neuropathol. Exp. Neurol. 58:138. Tang, T. et al. (1996) J. Clin. Invest. 97:2485. Piccio, L. et al. (2002) J. Immunol. 168:1940. Kerfoot, S.M. & P. Kubes (2002) J. Immunol. 169:1000. Piccio, L. et al. (2005) J. Immunol. 174:5805. Engelhardt, B. et al. (1997) Blood 90:4459. Osmers, I. et al. (2005) J. Neuroimmunol. 166:193. Engelhardt, B. et al. (2005) J. Immunol. 175:1267. Brown, K.A. (2001) Int. Immunopharmacol. 1:2043. Defazio, G. et al. (2000) Brain Res. 881:227. Wong, D. & K. Dorovini-Zis (1992) J. Neuroimmunol. 39:11. Defazio, G. et al. (1998) J. Neuroimmunol. 88:13. Dobbie, M.S. et al. (1999) Brain Res. 830:330. Lyck, R. et al. (2003) Blood 102:3675. Adamson, P. et al. (1999) J. Immunol. 162:2964. Alter, A. et al. (2003) J. Immunol. 170:4497. Bo, L. et al. (1996) J. Neuropathol. Exp. Neurol. 55:1060. Wilcox, C.E. et al. (1990) J. Neuroimmunol. 30:43. Floris, S. et al. (2002) J. Neuroimmunol. 127:69. Willenborg, D.O. et al. (1993) J. Neuroimmunol. 45:147. Kawai, K. et al. (1996) Cell. Immunol. 171:262. Archelos, J.J. et al. (1993) Ann. Neurol. 34:145. Swerlick, R.A. et al. (1992) J. Immunol. 149:698. Sironi, M. et al. (1994) Blood 84:1913. Steffen, B.J. et al. (1994) Am. J. Pathol. 145:189. Gelati, M. et al. (2000) Can. J. Neurol. Sci. 27:241. Steinman, L. (2005) Nat. Rev. Drug Discov. 4:510. Cannella, B. & C.S. Raine (1995) Ann. Neurol. 37:424. Peterson, J.W. et al. (2002) J. Neuropathol. Exp. Neurol. 61:539. Newman, P.J. (1997) J. Clin. Invest. 99:3. Niezgoda, A. & J. Losy (2002) Folia Morphol. 61:143. Graesser, D. et al. (2002) J. Clin. Invest. 109:383. Qin, J. et al. (2004) PLoS Biol. 2:e169. Lee, J.W. & R. Juliano (2004) Mol. Cells 17:188. Calderwood, D.A. (2004) J. Cell Sci. 117:657. Plow, E.F. et al. (2000) J. Biol. Chem. 275:21785. Tsukada, N. et al. (1993) Autoimmunity 14:329. Raine, C.S. et al. (1990) Lab. Invest. 63:476. Kobayashi, Y. et al. (1995) Cell. Immunol. 164:295. Welsh, C.T. et al. (1993) J. Neuroimmunol. 43:161. Baron, J.L. et al. (1993) J. Exp. Med. 177:57. Yednock, T.A. et al. (1992) Nature 356:63. Myers, K.J. et al. (2005) J. Neuroimmunol. 160:12. Cannella, B. et al. (2003) J. Neurosci. Res. 71:407.
van der Laan, L.J. et al. (2002) J. Neurosci. Res. 67:191. Piraino, P.S. et al. (2005) J. Neuroimmunol. [Epub ahead of Print]. Muraro, P.A. et al. (2004) J. Neuroimmunol. 150:123. Calabresi, P.A. et al. (1997) Neurology 49:1111. Eikelenboom, M.J. et al. (2005) J. Neuroimmunol. 158:222. Berger, J.R. & I.J. Koralnik (2005) N. Engl. J. Med. 353:414. Murphy, P.M. et al. (2000) Pharmacol. Rev. 52:145. Cartier, L. et al. (2005) Brain Res. Brain Res. Rev. 48:16. Boven, L.A. et al. (2000) Clin. Exp. Immunol. 122:257. McManus, C. et al. (1998) J. Neuroimmunol. 86:20. McManus, C.M. et al. (1998) J. Immunol. 160:1449. Simpson, J.E. et al. (1998) J. Neuroimmunol. 84:238. Woodroofe, N. et al. (1999) Adv. Exp. Med. Biol. 468:135. Balashov, K.E. et al. (1999) Proc. Natl. Acad. Sci. USA 96:6873. Simpson, J.E. et al. (2000) Neuropathol. Appl. Neurobiol. 26:133. Van Der Voorn, P. et al. (1999) Am. J. Pathol. 154:45. Simpson, J. et al. (2000) J. Neuroimmunol. 108:192. Goldberg, S.H. et al. (2001) Neuropathol. Appl. Neurobiol. 27:127. Omari, K.M. et al. (2005) Brain 128:1003. Sorensen, T.L. et al. (2002) J. Neuroimmunol. 122:125. Saruhan-Direskeneli, G. et al. (2003) J. Neuroimmunol. 145:127. Scarpini, E. et al. (2002) J. Neurol. Sci. 195:41. Sindern, E. et al. (2001) Acta Neurol. Scand. 104:88. Bartosik-Psujek, H. & Z. Stelmasiak (2005) Eur. J. Neurol. 12:49. Franciotta, D. et al. (2001) J. Neuroimmunol. 115:192. Kastenbauer, S. et al. (2003) J. Neuroimmunol. 137:210. Ishizu, T. et al. (2005) Brain 128:988. Narikawa, K. et al. (2004) J. Neuroimmunol. 149:182. Miyagishi, R. et al. (1995) J. Neurol. Sci. 129:223. Bartosik-Psujek, H. & Z. Stelmasiak (2005) J. Neural Transm. 112:797. Nakajima, H. et al. (2004) Eur. Neurol. 52:162. Sorensen, T.L. et al. (1999) J. Clin. Invest. 103:807. Martinez-Caceres, E.M. et al. (2002) Mult. Scler. 8:390. Pashenkov, M. et al. (2003) J. Neuroimmunol. 135:154. Sorensen, T.L. et al. (2002) J. Neuroimmunol. 127:59. Giunti, D. et al. (2003) J. Leukoc. Biol. 73:584. Pashenkov, M. et al. (2002) Clin. Exp. Immunol. 127:519. Kivisakk, P. et al. (2004) Ann. Neurol. 55:627. Trebst, C. et al. (2001) Am. J. Pathol. 159:1701. Trebst, C. et al. (2003) Neuropathol. Appl. Neurobiol. 29:584. Trebst, C. et al. (2003) Am. J. Pathol. 162:427. Filipovic, R. et al. (2003) Dev. Neurosci. 25:279. Hvas, J. et al. (1997) Scand. J. Immunol. 46:195. Misu, T. et al. (2001) J. Neuroimmunol. 114:207. Sorensen, T.L. & F. Sellebjerg (2001) Neurology 57:1371. Eikelenboom, M.J. et al. (2002) J. Neuroimmunol. 133:225. Teleshova, N. et al. (2002) J. Neurol. 249:723. Sindern, E. et al. (2002) J. Neuroimmunol. 131:186. Wang, H.Y. et al. (2002) J. Neuroimmunol. 133:184. Mahad, D.J. et al. (2002) J. Neurol. Neurosurg. Psychiatry 72:498. Kivisakk, P. et al. (2002) Clin. Exp. Immunol. 129:510. Jalonen, T.O. et al. (2002) J. Neurol. 249:576. Karpus, W.J. et al. (2003) Methods 29:362. Fife, B.T. et al. (2001) J. Immunol. 166:7617. Kohler, R.E. et al. (2003) J. Immunol. 170:6298.
dos Santos, A.C. et al. (2005) J. Neuroimmunol. 162:122. Zang, Y.C. et al. (2000) Brain 123:1874. Zang, Y.C. et al. (2001) J. Neuroimmunol. 112:174. Sorensen, T.L. et al. (2001) Eur. J. Neurol. 8:665. Bartosik-Psujek, H. et al. (2004) Acta Neurol. Scand. 109:390. Tran, E.H. et al. (2000) Eur. J. Immunol. 30:1410. Rottman, J.B. et al. (2000) Eur. J. Immunol. 30:2372. Murphy, C.A. et al. (2002) J. Immunol. 169:7054. Fife, B.T. et al. (2000) J. Exp. Med. 192:899. Lee, M.H. & G. Murphy (2004) J. Cell Sci. 117:4015. Folgueras, A.R. et al. (2004) Int. J. Dev. Biol. 48:411. Baker, A.H. et al. (2002) J. Cell Sci. 115:3719. Beaudeux, J.L. et al. (2004) Clin. Chem. Lab. Med. 42:121. Bode, W. et al. (1999) Ann. N. Y. Acad. Sci. 878:73. Yong, V.W. et al. (2001) Nat. Rev. Neurosci. 2:502. Opdenakker, G. et al. (2003) Lancet Neurol 2:747. Rosenberg, G.A. (2002) Neuroscientist 8:586. Gijbels, K. et al. (1992) J. Neuroimmunol. 41:29. Mandler, R.N. et al. (2001) Brain 124:493. Lee, M.A. et al. (1999) Brain 122:191. Waubant, E. et al. (1999) Neurology 53:1397. Waubant, E. et al. (2003) Neurology 60:52. Blanco, Y. et al. (2004) J. Neuroimmunol. 153:190. Cuzner, M.L. et al. (1996) J. Neuropathol. Exp. Neurol. 55:1194. Anthony, D.C. et al. (1997) Neuropathol. Appl. Neurobiol. 23:406. Cossins, J.A. et al. (1997) Acta Neuropathol. 94:590. Leppert, D. et al. (1996) Ann. Neurol. 40:846. Stuve, O. et al. (1996) Ann. Neurol. 40:853. Trojano, M. et al. (1999) Neurology 53:1402. Uhm, J.H. et al. (1999) Ann. Neurol. 46:319. Yushchenko, M. et al. (2003) J. Neurol. 250:1224. Rosenberg, G.A. et al. (1996) Neurology 46:1626. Nygardas, P.T. & A.E. Hinkkanen (2002) Clin. Exp. Immunol. 128:245. Gijbels, K. et al. (1993) J. Neurosci. Res. 36:432. Gijbels, K. et al. (1994) J. Clin. Invest. 94:2177. Hewson, A.K. et al. (1995) Inflamm. Res. 44:345. Brundula, V. et al. (2002) Brain 125:1297. Dubois, B. et al. (1999) J. Clin. Invest. 104:1507. Maeda, A. & R.A. Sobel (1996) J. Neuropathol. Exp. Neurol. 55:300. Kouwenhoven, M. et al. (2001) J. Autoimmun. 16:463. Kouwenhoven, M. et al. (2002) J. Neuroimmunol. 126:161. Bar-Or, A. et al. (2003) Brain 126:2738. Galboiz, Y. et al. (2001) Ann. Neurol. 50:443. Abraham, M. et al. (2005) J. Neuroimmunol. 163:157. Correale, J. & L. Bassani Molinas Mde (2003) J. Neuroimmunol. 140:198. Liuzzi, G.M. et al. (2002) Mult. Scler. 8:222. Lichtinghagen, R. et al. (1999) J. Neuroimmunol. 99:19. Sellebjerg, F. et al. (2000) J. Neuroimmunol. 102:98. Leppert, D. et al. (1998) Brain 121:2327. Vos, C.M. et al. (2003) J. Neuroimmunol. 138:106.